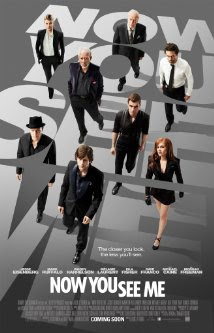 MOVIE REVIEW: "Now You See Me"
Every once in a while, it’s fun to take a break from the more serious works of art I like to engage with and to just go see a fun summer flick. Recently, a friend from school and I went to see “Now You See Me”, a diverting if ultimately disappointing effort starring such screen heavyweights as Morgan Freeman, Mark Ruffalo, Jesse Eisenberg, and Woody Harrelson, as well as Isla Fisher, Dave Franco, Michael Caine and Mélanie Laurent. The film is perfectly adequate for what it is: a fun, twisty, rollicking adventure--this summer's “Mission Impossible: Ghost Protocol”, if you will. However, this film did not truly dazzle me with all the enchantment promised by its subject matter. Trigger Warning: This review contains references to transphobia. The film centers around four magicians: Daniel Atlas (Jesse Eisenberg), a cocky, arrogant card-trick master; Henley Reeves (Isla Fisher), Daniel’s former assistant and a confident, sassy performer of death-defying stunts; Merritt McKinney (Woody Harrelson), a cheeky mentalist fallen from prominence; and Dave Franco’s Jack Wilder, a naïve sleight-of-hand artist. At the beginning of the film, these four disparate talents are recruited by a mysterious employer. Their task? To come together and form one act, to astound audiences and backers with their unique combination of gifts—and, also, to rob banks around the globe during their shows. Mark Ruffalo and Mélanie Laurent play FBI and Interpol agents Dylan Rhodes and Alma Dray, respectively, who must work with Thaddeus Bradley (Morgan Freeman), a wry, perpetually amused former magician who now rakes in the dough exposing fake magicians on television. Their goal is to nab “The Four Horsemen”, as the four core magicians have titled their act, and to figure out how they committed their seemingly impossible heists. A magic film and a heist film rolled into one? The idea certainly is promising, and the action of the film does not disappoint. From sharply edited magic tricks to well-choreographed action sequences, the film is visually entertaining. The magic tricks are clever and left me delighted. Who doesn’t love well-executed magic tricks? Plot twists and elements that prove prominent in key moments later in the film are satisfyingly alluded to and foreshadowed, creating the impression (or illusion) of a neatly made, tightly-written film. However, the film sacrifices true depth of characterization of its leads in its quest to be purely entertaining, and the film suffers as a result. We are left rooting for—and against—a series of charming façades. Danny, Henley and Merritt are all broadly defined character types. Jesse Eisenberg plays amusingly against type; rather than an unsure nerd, his Danny Atlas is a confident womanizer. Woody Harrelson’s sly mentalist provides much of the humor of the movie. Isla Fisher’s Henley provides what little emotional resonance the four central characters have. Poor Dave Franco has to deal with nonexistent characterization other than “naïve newcomer” and limited screen time; he lacks the same ease of banter that his more established cast mates flaunt with aplomb. Mark Ruffalo, on the other hand, brings some much-needed soulfulness and sensitivity to his portrayal of a dogged FBI agent searching for justice, and Melanie Laurent is alluring in her role, though her chemistry with Ruffalo’s Rhodes is situational, clichéd and often forced. The stalwart Morgan Freeman, the closest character this film has to a villain, is mysterious and enjoyable in yet another underwritten role. Essentially, this film would not have worked on any level had it not lucked out with its stars. The film also stumbles a bit with the addition of a sort of mystical magician mythos that serves to convolute the already twisty plot. I would have traded this element, and the amount of screen time it occupies, for some stronger writing of Dave Franco’s and Isla Fisher’s characters, and for more time to establish the relationship among the four core characters. The movie’s key twist, which I shall not enumerate here, is pleasantly hard to predict, suitably foreshadowed, and elicited a cry of genuine surprise from both my companion and me. However, said twist sadly undermines the actions and characterization of a character we come to support over the course of the film, and ultimately left me feeling a bit emotionally robbed. On a downright negative note, there are some truly mean-spirited situations in this film that undermine its fluffy, harmless popcorn vibe. There’s a moment early in the film where Danny makes unkind and unnecessary comments about Henley’s weight in an attempt to establish their former relationship as magician and assistant that I found unexpectedly sour. Additionally, Woody Harrelson’s carefree mentalist drops some wholly uncalled-for transphobic language during an otherwise amusing montage of FBI interrogations that took me out of the film in a bad way. I remember thinking in response: "It's 2013, people; we can do better than that." Magic seems to be in that scented film industry air right now. With the release earlier this year of “The Incredible Burt Wonderstone” and this new offering, Hollywood is clearly dipping its toe into the world of tricks and illusions anew. I hope the box office returns are enchanting enough to persuade Hollywood to produce some magic-related films over the next several years with some substance behind the flash. I feel like the film would have been 500% better with a Gob Bluth cameo and a looping "Final Countdown" soundtrack. I have yet to see the movie. However, my impression of it was that it is supposed to be "summer fare" meaning light and entertaining. if that is how it is being billed, your review suggests it meets its stated purpose. I enjoy these actors and I love magic so if that is what I am going for, I will likely enjoy the flick. Thanks for your insightful review. I love reading your perspective as always! TELEVISION REVIEW: "Orange is the New Black"
ESSAY: On Leonardo da Vinci's "Hercules"